Watercolor. Signed by the artist lower right and dated 1867. Mariano Fortuny is arguably the greatest Spanish artist of the 19th century. He began his training in earnest in Barcelona in 1852 where his first master was the painter Claudio Lorenzale y Sugrañes. Fortuny soon abandoned his master's influence and moved away from the linear purity of the German Nazarenes in favor of a broader and more immediate approach, inspired by Fortuny's interest in the lithographs of Paul Gavarni. Fortuny soon developed a superb color sense which was enhanced by his interest in Orientalist subject matter. This interest imbued his paintings and watercolors from the 1860s onwards with a superb integration of pictorial detail and color. Our drawing shows his supple approach to watercolor. Fortuny often overlaid areas of dense, saturated color and juxtaposed them with more thinly applied color. The result is a rich, almost tapestry-like screen of color. The Cavalier is also realized in terms of the artist’s colorism, but here a sly sense of the artist’s amused detachment creeps into the portrayal. Our cavalier seems hardly a gallant swashbuckler, but rather a somewhat worn and down-at the-heels soldier. 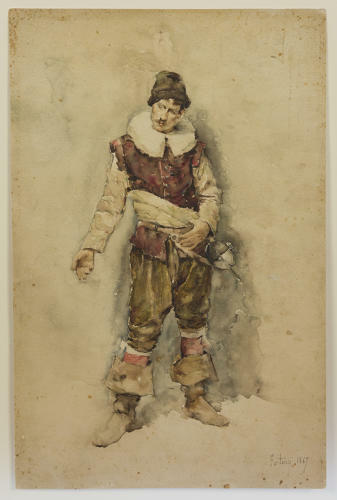 His worn and motley garments, his slightly melancholy expression, and his extended hand suggest a soldier down on his luck, perhaps even begging for coins.